William came in bright and early this morning waving the phone at me and telling me that Daddy was calling... it turns out, he got the car stuck because the East-West roads are horribly drifted. He was walking home, and wanted me to come get him, which I did without a problem (we're on a North-South road). He ended up taking the van and going to work via another route, no problem. Well, he called about an hour ago and wanted me to go check on the car. I should have argued. Really, I should have. But no, I bundled up, grabbed Connor, and headed out. Our driveway is completely drifted shut again. But I got out. I headed for where the car was, and the plows have been by so that road is almost passable. Almost. I had to drive backwards to get home though, as I couldn't possibly turn around, and after stopping, I couldn't go forward (uphill) either. 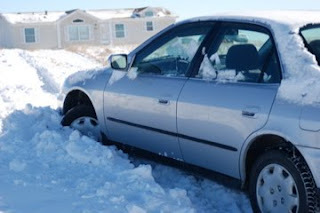 Got back home, maneuvered into position to charge the driveway... and got the car completely stuck in the drift. At least it is only a couple minute walk up the driveway, and I have three boys heading out right now to shovel at it. From prior experience, I know we'll be at it for a couple of hours. Just about enough time for Dale to get home and us to head out to dig out the other car. So much for spending an hour or so finishing up a couple of books we've been reading, so that we can take a completely guilt-free week or two off of everything school-related. And I planned to spend this afternoon making pierogies. Instead, we'll probably have spaghetti. Oh well. We may end up with a car being towed, but at least it looks like we'll all be together for Christmas, and that is what is important, right? Ah, yes. I was just this very instant thinking that this two week break was nearly half over and I have not done one single thing on my to do list. Why did I think that two weeks off somehow meant luxuriating in endless amounts of free time, ticking things off my list with practically no effort at all? But I am home with my family, so what else matters? Luxuriating in endless amounts of free time... ohhh, that sounds nice. Where can I sign up?! How is the potty training going, Deb? I'm thrilled to have that over with. My youngest uses a pull-up at night, but that's it. I hate potty training with the burning fire of a thousand suns.